Eugen Sandow is said to be the “father of modern bodybuilding”. It’s true in more than one sense: he was revitalized the marriage of physical strength with a visually pleasing shape, but he also introduced the shadier bits of the sport. When today you ask people who made bodybuilding and strength training popular, many will answer Arnold Schwarzenegger. Some may come up with Jack LaLanne, remembering his television show. But only a very few will mention Eugen Sandow. Yet Eugen was there long before them. Born in Germany in 1867 as Friedrich Wilhelm Müller, he was as ordinary a boy as any other, yet later became the probably first superstar of physical fitness, touring large cities, writing fitness books, appearing in short films and selling what we today would call fitness supplements. As a child I was myself exceedingly delicate. More than once, indeed, my life was despaired of. Until I was in my tenth year, I scarcely knew what strength was. Then it happened that I saw it in bronze and stone. My father took me with him to Italy, and in the art galleries of Rome and Florence I was struck with admiration for the finely developed forms of the sculptured figures of the athletes of old. I remember asking my father if people were as well developed in these “modern times”. He pointed out that they were not, and explained that these were the figures of men who lived when might was right, when men’s own arms were their weapons, and often their lives depended upon their physical strength. Moreover, they knew nothing of the modern luxuries of civilization, and, besides their training and exercise, their muscles, in the ordinary course of daily life, were always being brought prominently into play. The memory of these muscular figures was everpresent, and when we returned to my home in Königsberg I wanted to become strong like them. This may well have been what later set him apart from other strength artists of the time. Strongmen had already existed before he appeared, but they didn’t think about a visually pleasing physique. For them only absolute strength counted. Eugen Sandow wanted to be strong and have an aesthetically perfect shape. He joined a gymnasium, started strength training, but found himself not quite successful. Yet instead of giving up, he sat down and applied some analytical thinking to the problem: he reasoned that to make your muscles grow, you not only need to work them, you also have to understand how they work (an idea I very much echo). Studying anatomy, he learned that he could give “each individual muscle a movement” and could arrange the exercises so “that when some muscles are brought into play others are relaxed and left without strain”. Basically he had come up with the training system most, if not all, professional bodybuilders of today still follow. The novel approach soon paid off. Contrary to other strength artists, with Eugen audiences more often than not were more fascinated with the play of his muscles than his feats. While at 19 he was doing the same sideshows with the same chainbreaking and weightlifting stunts as other strongmen, by the age of 22 he already found himself on London stages and at 26 was under contract of influential Broadway impresario Florenz Ziegfeld. In 1894, he publishes his first book, Sandow’s System of Physical Training. In 1898, he establishes Sandow’s Magazine of Physical Culture, essentially the world’s first bodybuilding magazine. In 1899, he designs a special set of dumbbells, followed by many other fitness “appliances” marketed through the Sandow Appliance Company. In 1901, he devises the first major bodybuilding contest, called “The Great Competition”. In 1904, his third book, “Body Building”, is published. In 1911, he endorses “Plasmon”, an egg white powder, as an “essential food” for working out. In 1913, he takes the selling of workout supplements in his own hands, starting the Sandow Cocoa Company. It would be unfair to say that Eugen was only business-minded. Despite trying to make as much money as he can out of his fame, he was also among the first proponents of physical education in schools. He also believed that employers should give workers time off for daily exercise. 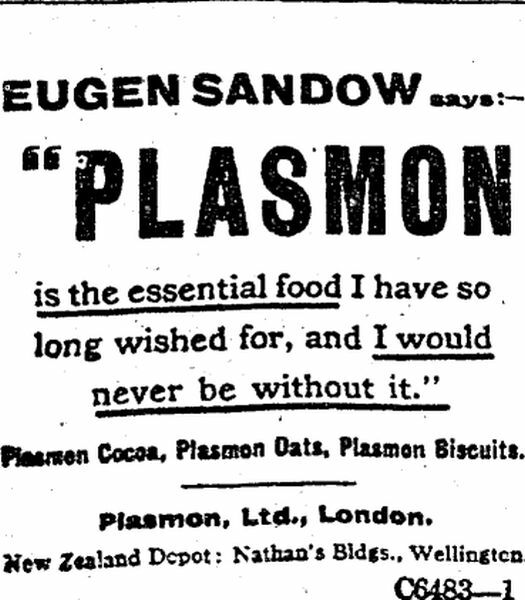 A 1911 advertisement for “Plasmon”. But there is no way around acknowledging that he originally had a very simple concept of exercise and nutrition, which he later either forgot or chose to neglect. Did the older Sandow truly believe that people needed his special cocoa powder and dumbbells to become fit? We will never know. But we do know that when young Eugen went and trained for the perfect physique he dreamed of, he had none of that to help him nor did he seem need it. Seeing it that way, Eugen Sandow not only made physical fitness popular and invented bodybuilding, he is also an important reminder of what is important in fitness: don’t believe the hype and educate yourself. For an excellent biography of Eugen Sandow have a look at David Chapman’s Sandow the Magnificent: Eugen Sandow and the Beginnings of Bodybuilding . Pictures courtesy of the Library of Congress and the National Library of New Zealand. By far, best article you written. THIS is the kind of article you should post more often. Glad you enjoyed it! If there are other topics in this direction you’d like to see covered, just let me know! nice one, thanks for the info Bro.